Supergirl 4.4: “Ahimsa” Review – Eggplante! Supergirl was inevitably going to have a hell of a time topping last week’s stellar Agent Liberty-focused episode. Sure enough, the show didn’t come anywhere near that standard this week. “Ahimsa” at least tried to take advantage of Kara being locked in a protective suit of anti-Kryptonite armour by focusing extensively on the supporting cast, but while some story arcs worked fairly well, others definitely fell short. This is especially true when the season makes a fairly extensive gear shift in the later reaches of this episode, while also clumsily trying to undo a few details from earlier in the season. Chief among these awkward retcons is the fact that Fiona, J’onn’s telepathic alien friend that ran the alien support group, in fact didn’t die from being stabbed in the back by Agent Liberty in the season premiere, somehow, and is actually being hooked up to a machine that projects and exploits her powers to further the agenda of Mercy, Otis and Agent Liberty. This plot also involves Mercy and Otis going to the DEO’s ‘Site B’, the old desert location from Supergirl’s first season, way back when it aired on CBS and not The CW, to free a copy alien, along with the Hellgrammite from the show’s sophomore episode. The two freed aliens then get possessed by Fiona’s exploited psychic abilities, and start attacking key locations in National City, being completely controlled by the human bad guys. This is sort of an interesting idea, but it seems like Supergirl is awkwardly changing its mind about killing off Fiona, when it instead has this idea to exploit her powers to bring back some old alien threats, though this at least provides a decent excuse to create a throwback to the early days of Fort Rozz. The other alien aside from the Hellgrammite appears to simply copy himself while attacking a police station, resulting in a fairly decent action scene, albeit one that also borrows some inspiration from the Multiplex scenario seen in The Flash’s sophomore episode. 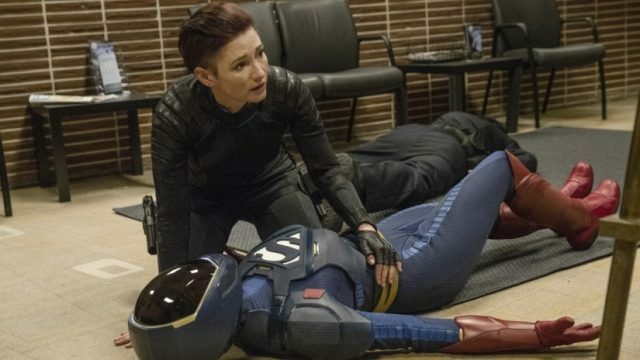 This scene does involve Kara stupidly charging into danger when she’s been ordered to stand down however, setting up Alex to get in trouble with the new President, while also pointlessly endangering herself by inserting herself into a battle that was clearly already being handled by the DEO’s agents. Hell, even J’onn drops in to finally start throwing down again! It’s about time too! Regarding Alex, she was definitely the highlight of this week’s episode, easily possessing the strongest of the character arcs at play this week. Alex is quickly ending up in over her head running the many responsibilities of the DEO, and after she ends up chewed out by the president for Kara’s reckless ‘assist’ at the police station (even more frustrating is that this obviously wasn’t Alex’s fault, and Kara is just being a moron), she starts feeling like J’onn made the wrong choice in placing her in charge of the DEO’s operations. This results in a pretty nice scene shared between J’onn and Alex, highlighting exactly why J’onn felt comfortable passing the torch of the DEO to Alex in the first place. The two end up helping each other in fact, particularly as J’onn is finally starting to confront the fact that his path of pacifism and trying to follow his father just isn’t working, though J’onn nonetheless ends up comforted and given renewed focus by Alex, who benefits from his higher wisdom. J’onn also had something of an assist with his own character arc aside from Alex this week, in the form of Fiona’s fiance, Manchester Black, a re-tooled version of a cocky, reckless anti-hero that once came into conflict with Superman in DC Comics lore, alongside his fellow powered vigilante group known as ‘The Elite’. The Elite don’t currently appear to exist in the Supergirl universe (although Black hinting that he ran with a gang of, “Soccer hooligans” could foreshadow an altered version of The Elite eventually coming to the show in the future), but Black is nonetheless hell-bent on rescuing Fiona, breaking into J’onn’s apartment by deducing J’onn’s connection to his fiancee. There isn’t much to Black’s character yet, beyond being a devout fiance with a rough past, but the somewhat more big-hearted take on Manchester Black could have some potential, especially when he’s got a fresh means to get angry in the wake of Fiona actually visibly dying this time, after he just barely fails to make it to her in time during the episode’s climax. Yeah, that’ll do it. Speaking of the climax, it basically repeated the same scenario as at the NCPD precinct, wherein Mercy and Otis try to exploit Fiona’s psychic abilities to control the two freed Fort Rozz aliens, this time attacking the National City Fair. Kara once again joins Alex in battle, this time with Alex’s permission, thankfully, and the two manage to subdue the Hellgrammite and the copy alien again, only to have Otis end up holding Supergirl at gunpoint, threatening to shoot open the armour and expose Kara to the lethal Kryptonite atmosphere. This would have been a nicely intense situation, if not for another quick do-over of an earlier story arc, namely the show already cleaning away the Kryptonite atmosphere with the influence of Brainy and Lena. 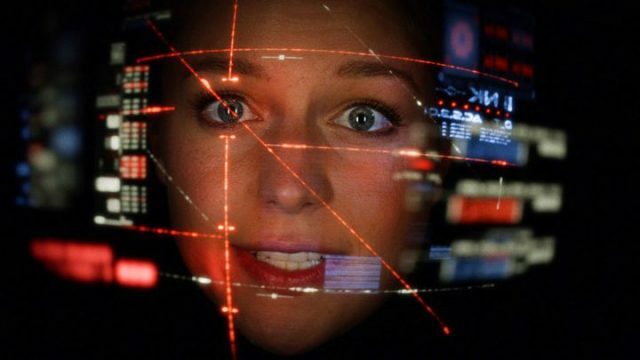 Granted, the idea of the two using the late Jack Spheer’s nanite machines to purge the Kryptonite mist is kind of inspired, but this proved to be a disappointingly anti-climactic end to Kara having to be stuck in a protective suit that heavily limits her ability to fight and protect people. Moreover, the Hellgrammite seemingly killing Mercy and Otis before simply surrendering felt even more anti-climactic, not to mention infuriating, since this just thanklessly dispatches the two consistently best antagonists that this show has had in quite some time! 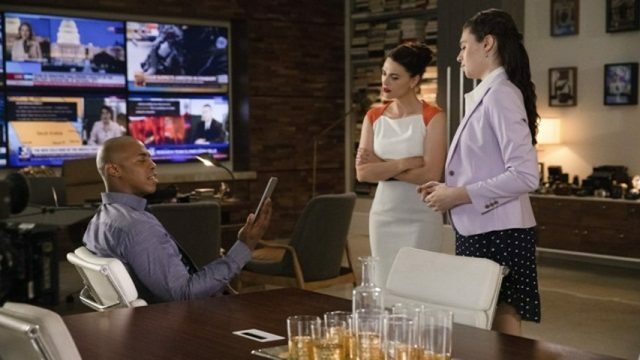 Granted, it’s possible that this is a fake-out, especially since killing off Mercy and Otis before Lex Luthor shows up later in the season would be a colossal missed opportunity, but I wouldn’t exactly put it past Supergirl to make a blatantly stupid storytelling decision, only to try and awkwardly backtrack from it later, once said decision is obviously proven to be a bad idea in the long term. It seems like this problem is also hanging over James, who is once again faced with having to don the mantle of Guardian, now that Kara is seemingly out of commission. Yeah, yeah, Kara doesn’t stay on the bench at all in the end, but just go with it. The idea of Supergirl being incapacitated and James having to step up out of necessity is an interesting one, and it does allow James to help out a bit as Guardian during the climax at the fair. What’s frustrating here though is that the show has to awkwardly try and switch gears yet again with Nia’s character, who is suddenly telling James not to act, which doesn’t really make sense, given that Nia is supposed to have a heart that’s bigger than her brain. It doesn’t mean anything anyway, since James just blatantly ignores Nia, making this entire scene with Nia pleading about Guardian end up being entirely pointless. Not only that, but when James quite openly brings his Guardian persona back, the public lauds him for it, and he’s not arrested, or charged, or doesn’t see any consequences at all in fact. What the hell?! What was even the point of the D.A.’s threat to James about being Guardian again then?! I will at least say that the idea of Guardian accidentally trending as a pro-human advocate that serves as a symbol for human rights, with some helpful propaganda from Agent Liberty helping that along, sounds like a great story idea, but how long will it be before Supergirl gets bored with this idea too, and just abruptly drops it? This awkward flightiness was really one of the most stubborn problems with, “Ahimsa”, namely the fact that this episode seems to have grown bored with the show’s current story direction, and quickly tries to clean house so that it could put Supergirl on a new plotting path. Addressing the insecurities of Alex and J’onn at least worked fairly well, and Manchester Black could become an interesting addition to the show, given his tragic circumstances and likable personality, but the quick elimination of Mercy and Otis completely deflated their presence as worthy human villains in an instant, not to mention that Kara barely spent any time in that anti-Kryptonite armour before a half-baked solution from Brainy and Lena handily presented itself. Sure, Agent Liberty is still at large, and seems to be making a fresh villain out of Jensen with some kind of alien worm that seems to foreshadow a new version of Superman/Supergirl villain, Parasite (doesn’t this go against Agent Liberty’s anti-alien beliefs? ), nicely setting up a familiar, albeit altered threat for next week, but I have my doubts about Agent Liberty being able to carry an entire season by himself, especially when that Russian Supergirl clone is still training hard for… Something bad, I’m sure. Supergirl was doing so well since its fourth season started, but the show seems to be falling back into some old habits with this week’s offering. I really hope it doesn’t start sliding back into ridiculous plotting and half-baked drama again, because it seemed like we were finally starting to move past that. Supergirl up-ended several ongoing story arcs to mixed effect this week, while also making a decent effort to spotlight the supporting cast once again.